I love everything about summer- especially when it really starts to get warm and on every corner in LA you’ll see a rainbow umbrella perched atop a fruit cart stand. Ripe watermelon, bright mango, juicy pineapple, melon, cucumber and jicama sliced large and wrapped in bags ready for the next customer drive by. If you want it served the traditional way, they’ll squeeze fresh lime juice and sprinkle chili lime seasoning on top. One summer I practically lived on these bags of fruit. I’d get off work late, pull up and buy a bag of Mexican fruit and sit in traffic long enough to miss dinner and be so exhausted by the time I got home that the only thing sustaining me after 3pm was the fruit. This is one of those snacks that takes little effort but most are too lazy to do. I mean you do need to wash and slice fruit so I get it. We are people of convenience. If I’m just making this for myself and only have a few ingredients on hand, I’ll try to do at least two sweet options and one vegetable. The recipe is so easy I’ll spare you on actually writing something out but basically you slice your fruit , sprinkle with a little fresh lime juice and top with chili lime seasoning or Tajin (these little to go packets are perfect). This is a great snack for on the go! Being a Mom forces you to always pack snacks and this is when I pack one for myself too. Wait to squeeze the lime and seasoning on top until you’re ready to enjoy. Would love to know what fruit combos you put together and if there are any other toppings you like, let me know! I’m always down to try something new. These donuts are the sweet secret weapon you are going to want to add to your recipe arsenal. Using only 5 ingredients you probably already have on hand, it’s the perfect treat to whip up any time of the day. And if you're as obsessed with Pantone's Color of the Year: Living Coral as I am, you'll love my trick to getting the perfect shade of glaze. I mean, even if you just want to make these for the insta-likes, you might as well, but the flavor of these donuts are bursting with bright citrus from the Sunkist Cara Cara Navel oranges. And because they’re baked instead of fried like traditional donuts, they are super light and fluffy but every bit delicious so let’s get started! Here’s what you need: pancake mix, sugar, freshly squeezed Sunkist Cara Cara Navel orange juice, yogurt, and eggs. Preheat your oven to 355°F and then into a bowl, mix all of the ingredients until the batter is nice and smooth. That’s it. Really. You toss 5 ingredients into one dish, give it a mix, and now we’re ready to pour the batter into our donut pan. A quick tip to getting the filling in the donut pan easily is to create a homemade piping bag. Just place a gallon size plastic bag in a jar and pour the batter into the bag, snip one of the corners and fill each well evenly. Tap the bottom of the pan to release any air bubbles and then bake for 15-18 minutes or until golden brown and baked through. Once the donuts are baked, place them on a wire rack to cool and then make your glaze. It’s just powdered sugar and some freshly squeezed Sunkist blood orange juice. Depending on how bold the color is of your blood orange will determine the color of your glaze. I love how mine ended up having this muted maroon shade! So pretty! 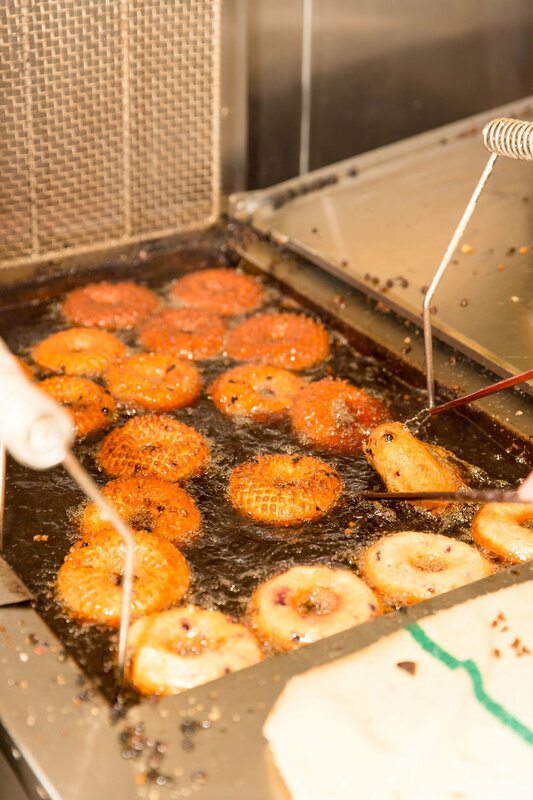 To frost the donuts, you can drizzle the glaze on top or spread some glaze around the top of the donut and let the excess fall. I love this “Homer Simpson” style look! If you’d like to add a garnish, do so while the glaze is still wet. I added a few sprinkles and a small segment of citrus on top of each! I mean, if you haven’t already paused scrolling to check your pantry to make sure you have everything to make these…. In a large bowl, combine the pancake mix and sugar. Add in the orange juice, yogurt and eggs. Stir well to combine. Batter should be smooth, but do not over-mix. Divide the batter evenly among the donut ring molds (a few tablespoons, depending on the size of the ring mold). Bake in preheated oven for 15-18 minutes. (Cooking times will vary depending on your oven. Start checking at the 12 minute mark.) Donuts should be golden brown and dry to the touch. Remove from the oven, and allow donuts to cool completely in the ring molds. Meanwhile, make glaze by mixing powdered sugar, zest and juice. If glaze is too thick, add 1/2 tablespoon of juice at a time until desired consistency. Frost donuts and garnish with sprinkles if desired. •	A donut pan is required for this recipe. •	Before removing from the oven, test donuts with toothpick to ensure they are cooked through. Preheat a grill or grill pan to medium-high heat. Brush the Brie with some of the oil. Grill until softened and grill marks appear, 3 to 4 minutes per side. Carefully transfer to a serving platter or board. Toss the strawberries in the brown sugar in a bowl until coated. Brush the grill with the remaining oil and add the strawberries cut-side down. Grill until the sugar is caramelized and the strawberries are tender, 1 to 2 minutes per side. Arrange the strawberries around and on top of the Brie. Garnish with the thyme and sprinkle with the fleur de sel and red pepper flakes. Serve warm with crackers. Optional: Try a drizzle of balsamic glaze for a decadent touch. This post was made possible by the U.S. Highbush Blueberry Council. Thank you for your support! 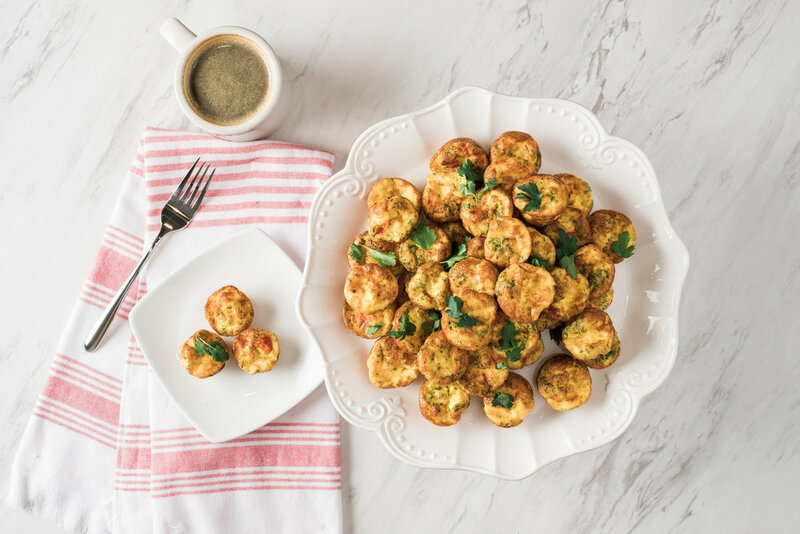 This is one of my go to appetizers anytime of the year but especially around the holidays. Who doesn’t love gooey cheese and warm bread? 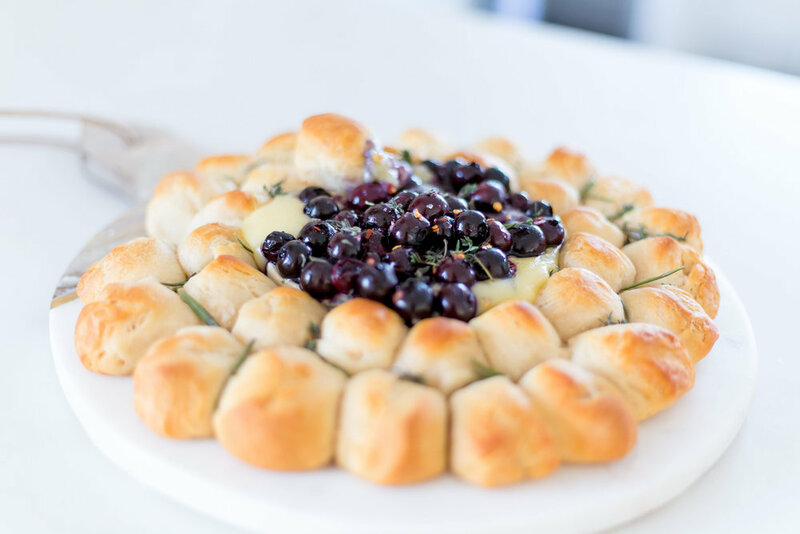 Topped with blueberries bursting with flavor and seasoned with thyme, rosemary and a little red pepper flakes, it’s the perfect balance of fruit to cheese to bread. I’m telling you right now you should pick up double ingredients and make two of them. They go quick. And if you’re like me you probably have most of the ingredients on hand. I keep blueberries by the boxful around here and always have a can or two of refrigerated biscuit dough. I usually have a bundle of fresh herbs in the fridge (it goes a long way!) or I’ll sometimes forage them around my hood. Ha! This is actually my third attempt at an herb garden but technically it’s not my fault they all died because I was over watering them cause I didn’t know Mr. A was also watering them and then this one time my basil just fried in the sun. It was sad. I don’t know what happened but that’s neither here nor there. And……. I should stop right now because you’re probably not even reading this anymore which is totally fine. Make this right now. You won’t regret it! And if it changes your life like I know it will, send me a shoutout on the gram! I love when you remake my recipes. Means the world. Hope you enjoy! Oh yeah and one more thing. Scroll down for the recipe and pics of Milly helping me with the final touches! She’s the yummiest! 1 (16.3-ounce) tube of biscuit dough like Pillsbury Grands! Preheat oven to 350°F and cover preferably a pizza stone (because it cooks evenly and provides a crispy bottom) or a baking sheet with parchment paper. Remove top of cheese round by carefully slicing the top of the rind off. Place cheese round in center of baking sheet with cut side up. Open biscuits and cut into quarters. Roll each piece of dough into a ball and place around cheese round until you have two rows of dough balls around the cheese. Bake for 25-30 minutes or until bread is cook through and golden brown. . Meanwhile, into a saucepan, add blueberries, red chili flakes, rosemary and thyme. Cook on medium low for 2-3 minutes or until blueberries start to darken and burst. Remove from heat and pour blueberry mixture on top of cheese. Garnish with fluer de sel and herbs as desired! Getting engaged to Mr. A was the most magical moment ever. Actually, our entire courtship was magical and a complete whirlwind. Our first date was the day after we met. Our second date, four days later. Two weeks after that I met his family. I spent Thanksgiving with them and remember thinking at the dinner table that I could absolutely marry this man and his family. That Christmas he came with me to AZ. Three months later we went on an epic trip to Asia visiting Thailand and the Philippines. Over the next several months we did a ton more travel to Big Bear, Vegas, Breckenridge, Sedona, NYC and I think there’s even more but I can’t remember. Then we decided to plan a trip to Tulum, Mexico to celebrate our almost one year anniversary. Little did I know that this trip would completely change our lives forever and I’d be getting proposed to! I get giddy just thinking about it. Luckily my hubs set up a camera before he asked me to marry him and we have the entire proposal on tape! We are also grateful to our dear friend, Jillian Ezra of Ezra Productions who invited us to talk about our proposal together with a his and hers perspective. Scroll down to watch the proposal and the interview of us sharing how it all went down! Make jam by placing blueberries, sugar and water in pot on medium-high heat and bring to a boil. Boil for a minute and mash slightly. Turn off heat to cool. Pour jam into clean jar and keep in refrigerator up to a month. 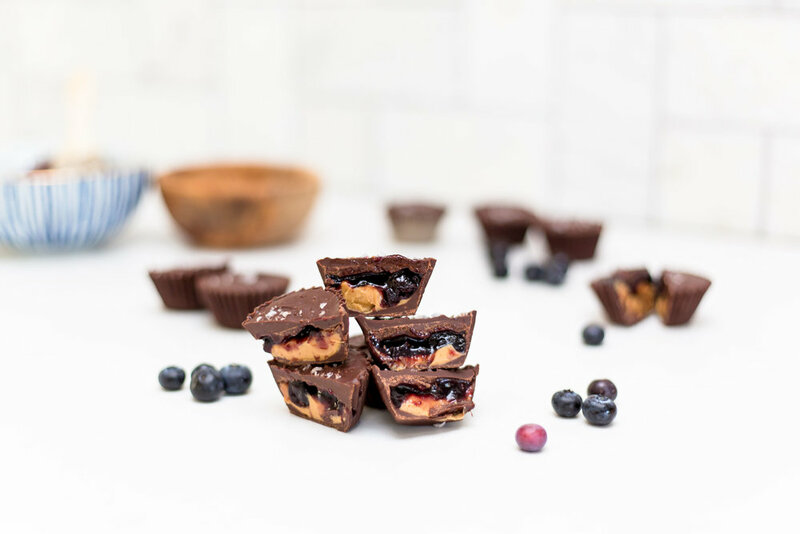 Using a pastry brush, spread chocolate up sides of mini muffin liners and place in muffin tin. Freeze to set, about 5 minutes. Spread 1/2 tablespoon of peanut butter into bottom of chocolate shell. Top each with 1/2 tablespoon of jam. Place back in freezer to harden, about 5 minutes. Top each cup with melted chocolate and garnish with a sprinkle of sea salt. Place back in freezer one final time to set completely. Keep in refrigerator for ultimate freshness and enjoy within 10 days! I don’t know about you but I’m trying to have a healthy marriage, one that lasts, endures and thrives! I wanna feel like a newlywed when I’m 100. Early on into our courtship Mr. A and I made the commitment to make our relationship top priority and after attending our first marriage retreat a few years ago, we decided we would commit to a couple’s retreat once a year. Last weekend we attended our second marriage retreat (we’ve been married two years so we are two for two!) and I left there feeling even more excited about the life we are creating together. I plan on writing a few posts about our experience and maybe I’ll even get Mr. A to guest host but here are the 7 things you should do everyday for a healthy marriage. This might seem pretty straight forward but “touch” is a huge part of the way we connect! In this day and age, so many of us are busier than we’ve ever been and if you are a parent on top of that, time together can be very limited. When we show affection to each other we are acknowledging one another and giving the other attention (which can also be a sign of respect), showing them they are important and cherished and most importantly, affirming your bond to one another. Set media boundaries. For example, no phones at the dinner table is a great one! Take time each day to envision what you want your marriage to look like. One of the exercises we did before we got married was write a family prayer. I definitely encourage you to do this with your spouse and family. You can call it a guide, blessing or mission statement/manifesto for your home but it was a great way for us to write down exactly how we want to live and what we hope to accomplish together as a family. Everyday we pray together. We pray for our family, our marriage and anything that is on our mind in our lives. Thoughts become things, things become habits. The more you envision what you want, the more likely you are to take the steps you need to make your vision become a reality. Ever since buying our home and becoming parents we’ve done a lot of walking. Maybe it’s cause when you have a newborn and want to get out of the house, a stroller walk seems like the easiest way to get fresh air. It could also be cause we are absolutely obsessed with our hood and love how close we are to the beach and all of our town’s stores and restaurants (we are so grateful). When we walk together we talk together. Go on a walk everyday with your spouse. Make it a thing. I’m telling you it will change your life. A walk is great for your heart (literally and figuratively). It gets your body moving, blood flowing and energy going. It allows you to decompress, connect with nature, relieve stress from the day and time to talk. And if you don’t want to talk, you are still walking side by side, breathing in fresh air, observing the world around you. We used to say that the sunshine was Milly’s babysitter cause no matter how upset she was we could take her outside and she would immediately stop fussing and start smiling. Connecting with the Earth allows us to connect with each other. The same things you fight about now will be the same things you fight about 20 years from now if you don’t let go of the little things. And, the little annoyances can lead to bigger issues if you don’t find a way to overcome them. Whether it’s figuring out who’s in charge of doing certain chores around the house but also understanding that all tasks are both of your responsibilities or accepting that they will always forget to hang up their wet towel and you’ve accepted you will always pick up the wet towel for them, you’ve gotta let go of the little things. No marriage is perfect. Even the healthiest marriages have challenges but what sets the ones that work and the ones that don’t apart- is exactly that. Work. Both people have to be on the same page about dealing with challenges and obstacles. This means resolving conflict together. And the quicker the conflict is resolved the better. Daily check ins are so crucial to making sure each person’s needs are being met. This is something you can do each evening or some time in the morning. I’d love to know if you have any tips for living a healthy marriage or please share any activities, resources, etc you use in your relationship below. And keep coming back to the site for more posts as I continue to share more of what we learned at our retreat. Thank you!